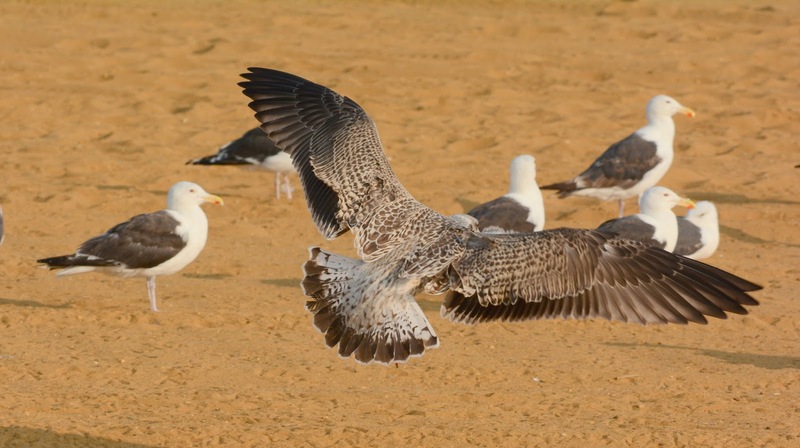 My short semi-annual runs to the East Coast are usually just enough time for me to visit the most popular gull hangouts between Chesapeake Bay, Delaware Bay and Cape May. Early August is the best time of the year for me to get my fill of Great Black-backeds, a species I don't regularly see in large flocks. 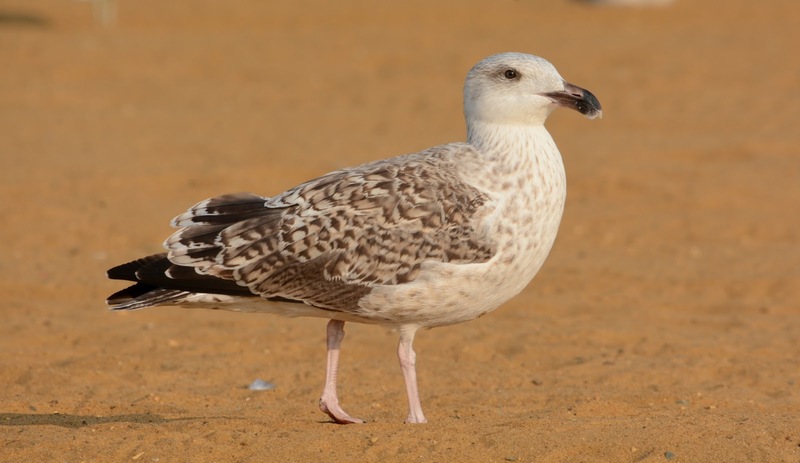 Below is a collection of GBBGs photographed on the beach adjacent to the South Cape May Meadows. The focus of this post is separating 1st summer and juvenile types - a task not too difficult. Great Black-backed (juvenile ~2.5 months old). Cape May, NJ. 07 August 2014. Great Black-backed (1st summer ~14 months old). Cape May, NJ. 07 August 2014. The 1st summer bird above is aged (at this time of year) by the relatively white head, paling bill, and plain upperparts (compare the greater coverts of both birds above, for instance). Also, the very short wing projection on the 1st summer bird is shorter than what we'd find on most fledgling juveniles by this date. Juvenile (standing) with 1st summer bird (resting). Note how plain the upperparts are on the 1st summer individual. The juvenile is wearing a much more pristine plumage and is more boldly patterned. 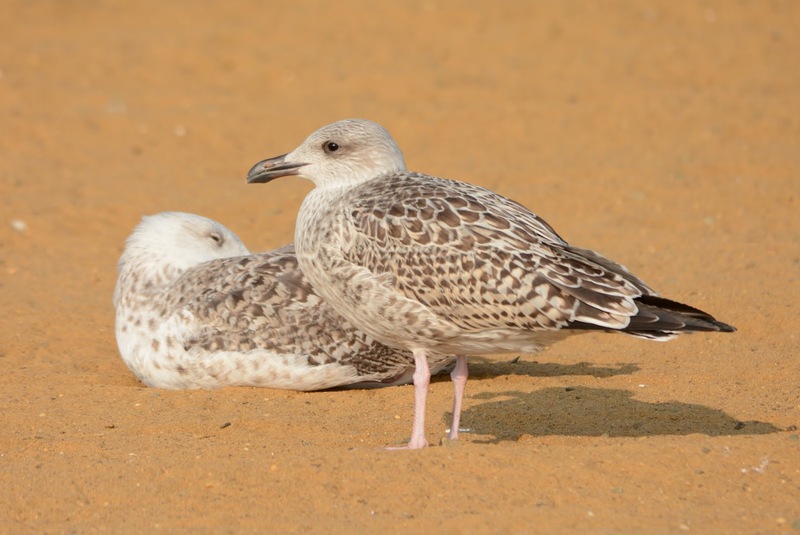 So juveniles are obviously classified as first cycles (juvenile plumage=first basic), but how exactly do we categorize the molt progression of "1st summer" birds? First summer, large white-headed gulls in the northern hemisphere are currently molting from first cycle to second cycle. In this molt, they're typically replacing all of their flight and body feathers via the 2nd prebasic molt (PB2). By mid-late fall most of these individuals are what we'd call 2nd cycles, but right now their plumage is a mixture of 1st generation and 2nd generation flight feathers. A good indicator that the 2nd prebasic molt is complete is when all of the rectrices, secondaries and primaries are renewed and fully grown. 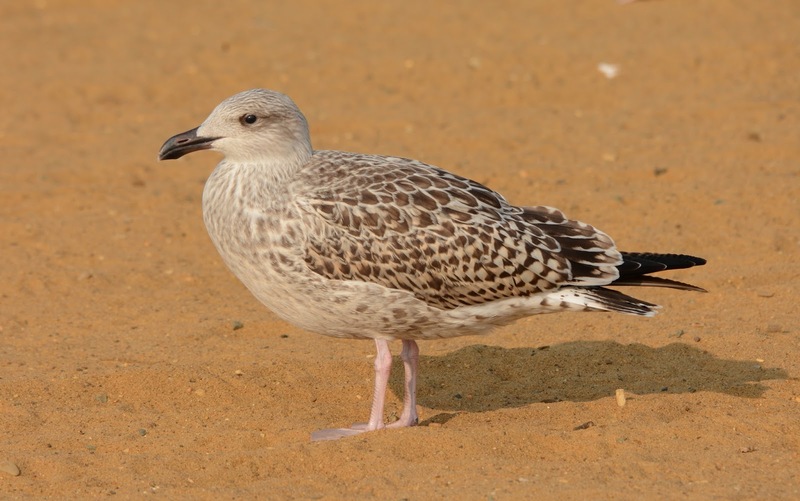 It's then generally safe for a field observer to say the gull is sporting its second basic plumage. Juvenile GBBG. Note how the flight feathers and tail feathers are all intact and neatly arranged. Compare with the first summer bird below. First Summer GBBG. Sheboygan, Wisconsin. 11 July 2014. Note the mostly new (2nd basic) primaries on the left wing. This bird has a retained juvenile primary (1st basic) and has dropped most of its secondaries. Much of the underwing coverts have also shed. Can you age these two? Certainly not a hatch year bird, right? As crisp and pristine as can be, this is clearly a recently fledged juvenile - one with little manners. The paling bill and white head/body feathers signal 1st summer. But also note the molting underwing coverts and old retained outer primary. Adult types in heavy molt. Likely a 3rd summer bird molting into 4th basic. Note the extensive brown tinge to the greater coverts and black on the bill tip. The rather slim neck and relatively "thin" bill suggest a female.